Word search puzzles are another type of printable worksheets I create to help my young students build, expand and retain their English vocabulary. 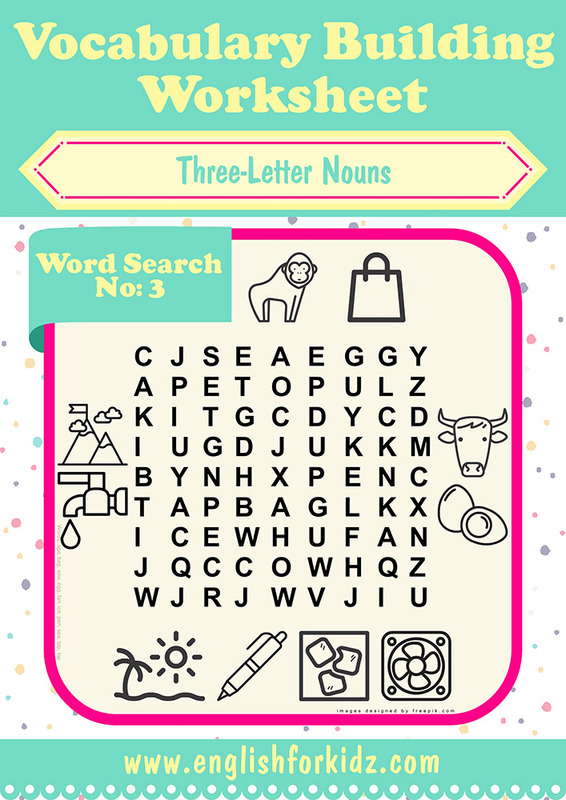 I keep on publishing my ESL worksheets designed to introduce three-letter nouns to kids. Three letter words are good both for children and adult beginners because they are easy to remember. 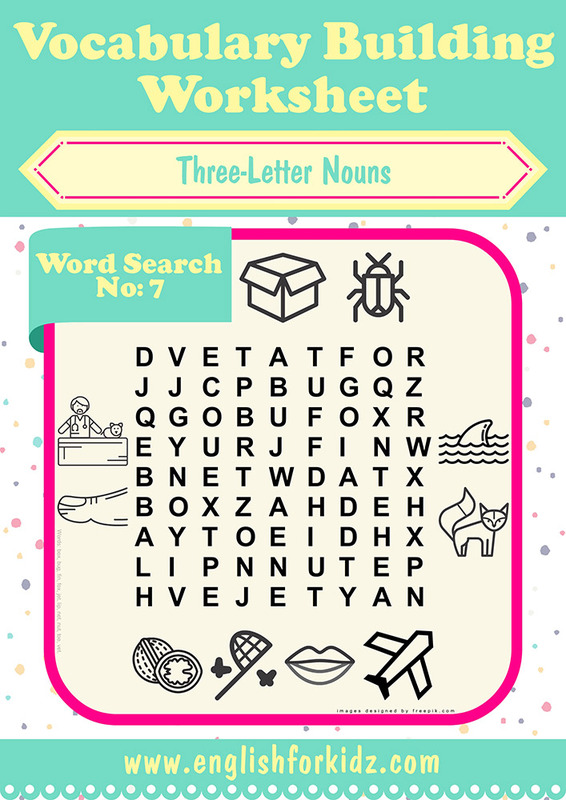 My collection of vocabulary building worksheets dedicated to three-letter nouns makes it possible to solidify these words into the active vocabulary of my students. 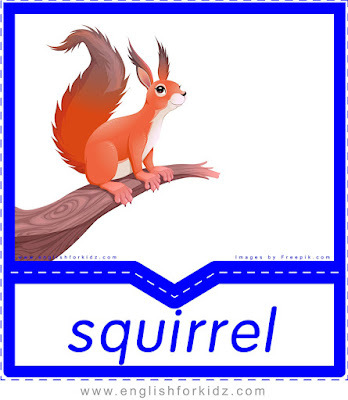 I have already published my three-letter nouns crossword puzzles, and this post in the second blog post of the series of publications dedicated to three-letter words. There are 80 three-letter nouns featured in my vocabulary building worksheets. The list includes the following words: ant, ape, arm, art, axe, bag, bat, bed, bee, bib, bow, box, boy, bug, bus, can, cap, car, cat, cow, cup, dog, dot, ear, egg, eye, fan, fin, fly, fox, hat, hay, hen, hut, ice, ink, jam, jar, jet, jug, key, leg, lip, log, man, map, mat, mop, mug, net, nut, oil, owl, pan, paw, pea, pen, pet, pie, pig, pin, pot, ram, rat, rod, saw, sea, sun, tap, tea, tie, toe, top, toy, van, vet, web, wig, yak, zoo. 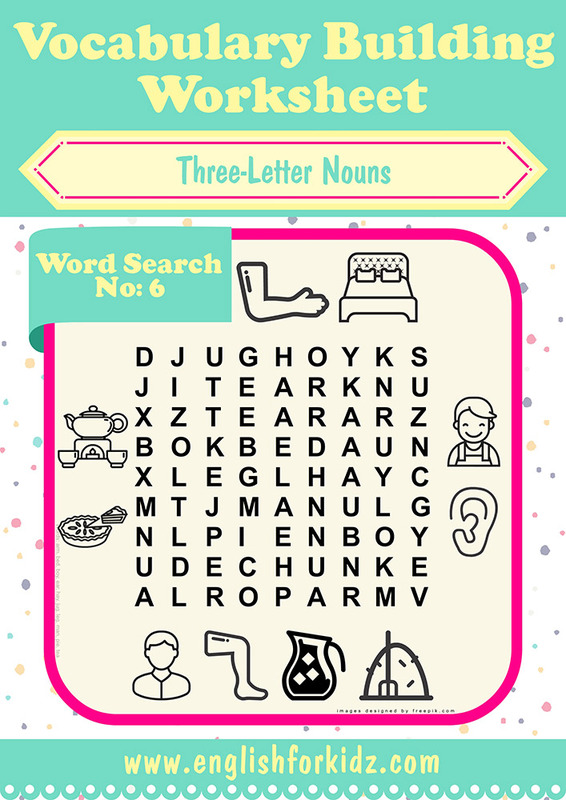 My printable word search puzzles help children memorize and recognized the above-listed nouns. I hope fellow teachers will find these worksheets useful in making their English lessons more fun and effective. So here are the printable three-letter nouns word search worksheet. 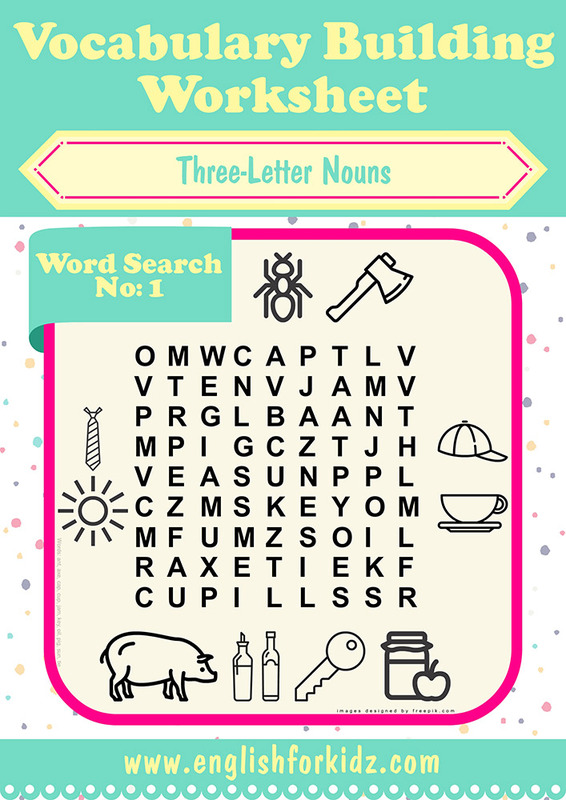 ESL word search puzzle for words ant, axe, cap, cup, jam, key, oil, pig, sun, tie. 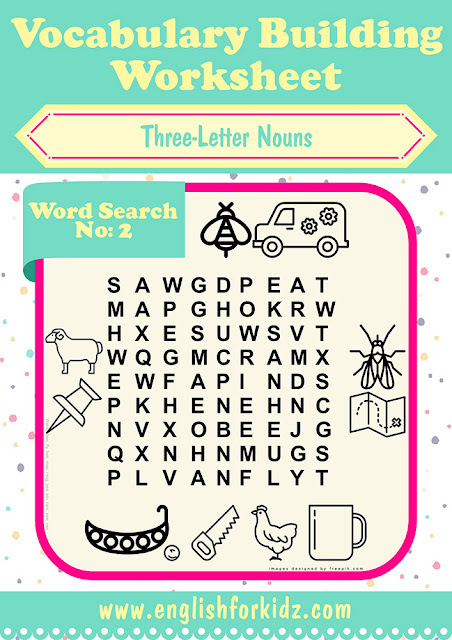 ESL word search puzzle for words bee, van, fly, map, mug, hen, saw, pea, pin, ram. ESL word search puzzle for words ape, bag, cow, egg, fan, ice, pen, sea, tap, top. 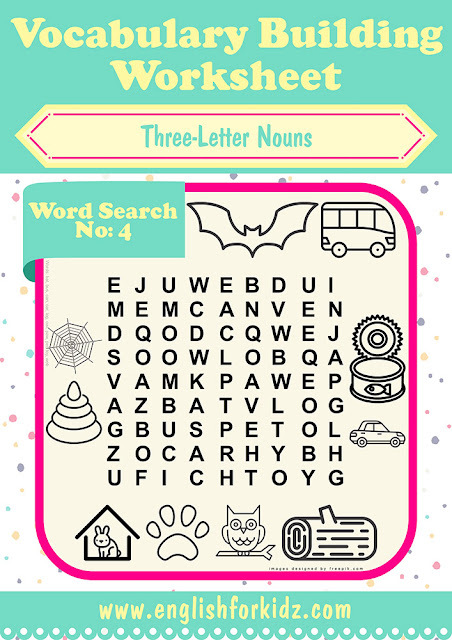 ESL word search puzzle for words bat, bus, can, car, log, owl, paw, pet, toy, web. 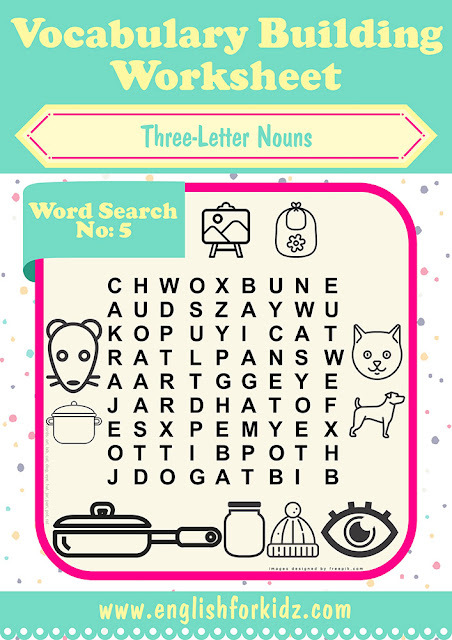 ESL word search puzzle for words art, bib, cat, dog, eye, hat, jar, pan, pot, rat. 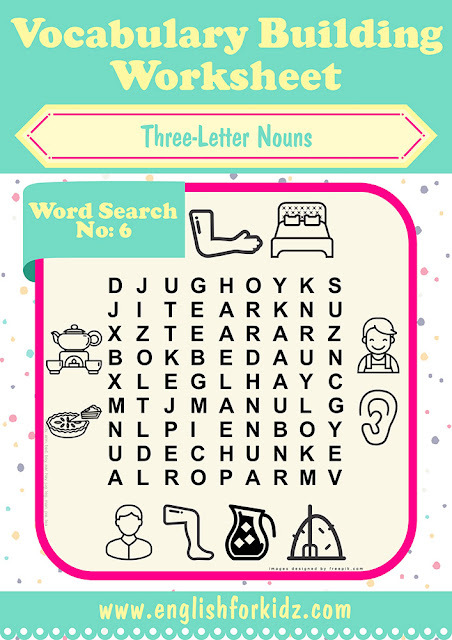 ESL word search puzzle for words arm, bed, boy, ear, hay, jug, leg, man, pie, tea. 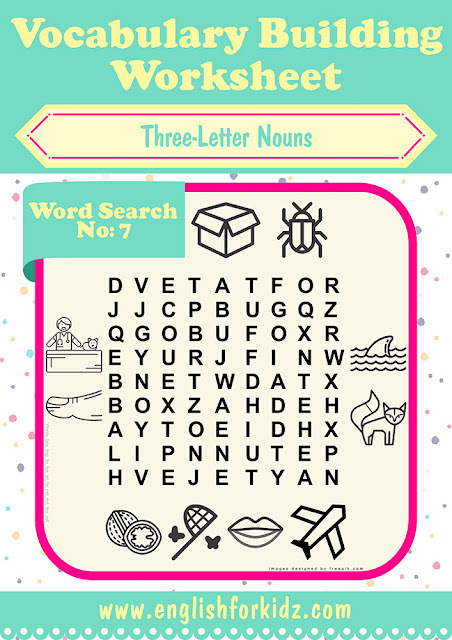 ESL word search puzzle for words box, bug, fin, fox, jet, lip, net, nut, toe, vet. 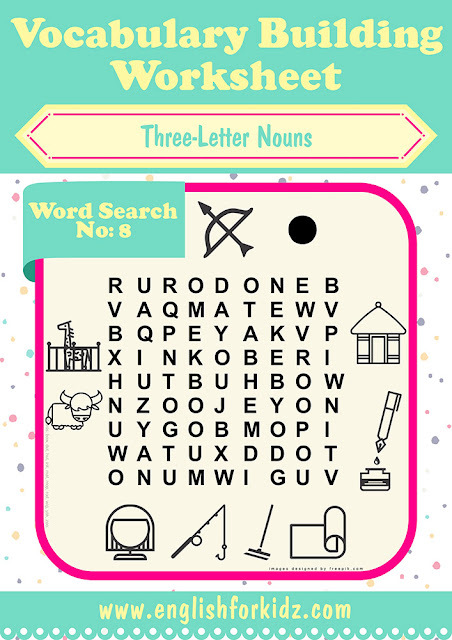 ESL word search puzzle for words bow, dot, hut, ink, mat, mop, rod, wig, yak, zoo.